Sorry this one is a day late. My roommates and I had "roommate Christmas" last night since we realized it was the last night we'd all be around for a while. Anyway, here's a link to the 12th day of Christmas file. It's a math game. Each player needs their own tree and 2 dice. Players roll the dice and find the sum. The corresponding ornament is added to the tree. The winner is the first player to completely decorate her tree. 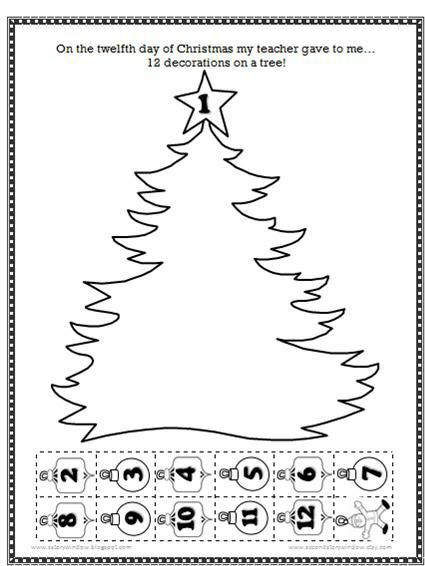 You'll notice that 1 is already on the tree since you can't get a sum of 1 with two dice. :) The Santa counts as a "wild." The player can put it on at any point when he rolls a number that's already on the tree. Hopefully this will take up some time on our last 1/2 day before the break! Thanks to those of you who've been 12 Daying with us. I hope you're able to enjoy some fun and games with your littles during this magical season. Merry Christmas! 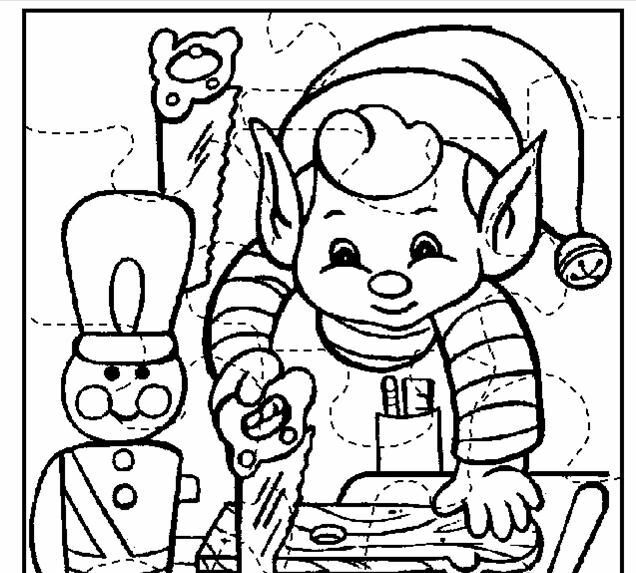 How about 11 puzzle pieces? This is another project where it's nice to have baggies or envelopes for the kids to keep their little pieces in. Also, if you're doing this in class I'd recommend asking the kids to put their initials on the back of each piece. It'll save a lot of hassle come clean-up time. "...my teacher gave to me 10 dots to link"
C'mon! This doesn't even qualify as a rhyme! Well, I guess "link" is closer than "connect" and do the kids really care anyway?? 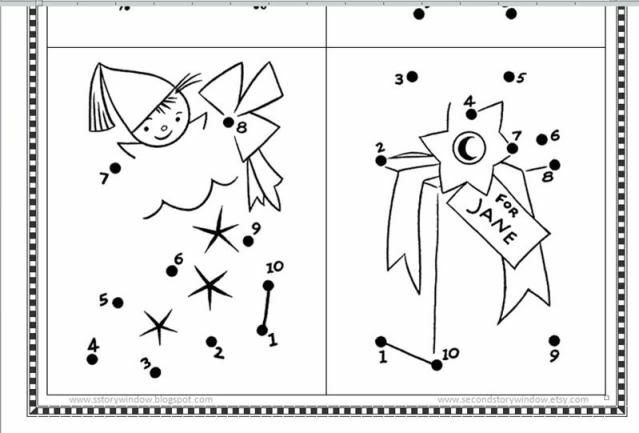 Probably not, so here are some little dot-to-dots. Yes, there are technically 80 dots in all, but the page was too bare with just one on it. You can get the file here. I love the vintage-y look of the pictures. I found these on-line years ago and have no idea of the source. If you know, please pass the info on so I can give credit. The kidlets can make these without too much fuss. It is helpful to have envelopes or baggies for the little pieces, though. 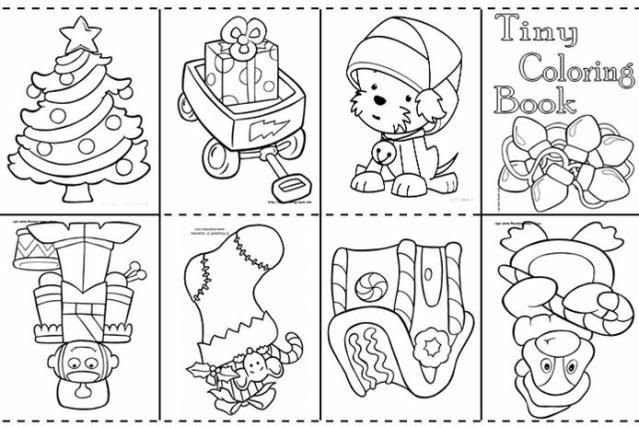 Today's gift is the world's tiniest coloring book! At least that's what I tell my class. They love showing off these when they're done. This is another craft where you have to do some step-by-step instructions. The kiddos need scissors and a copy of this page. The idea is to fold it into a tiny book. These are easy-peasy when you've done a couple, but at first they're a little tricky. Here's a diagram to walk you through it. If you're like me and need a step-by-step model, here's a 1 minute video I found on Youtube. Just remind kids to only cut on the center dotted line. It's actually easier to fold if you cut a teeny bit (like 1/4 inch) above the center line. P.S. We did the 2nd day of Christmas today, and like I feared, reducing the maze to 1/2 sheet was a mistake. A few were willing to give it a try, but most took one look at the itty-bitty tree maze and decided it was impossible. At least they enjoyed the other side! Read about the 12 Days of Christmas booklet here. Today we have a little 7-page story that the kids can help illustrate. We can call it shared reading for the day, right? 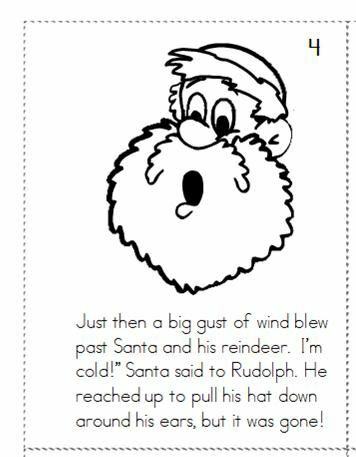 It's two days before Christmas and Santa has lost his hat! There's no time to get a new one, so he'll have to wear the one Frosty gave him. But what that looks like is up to you! This is pretty simple to put together. Each kid needs a copy of the story. Just cut, assemble, and staple. I tried to leave a margin on the right side so no text/pictures gets stapled up. You can get your storybook here. Halfway already! Christmas really is creeping up. One of my kids today said "Only 20 more days." My heart started racing. So much to do!!! 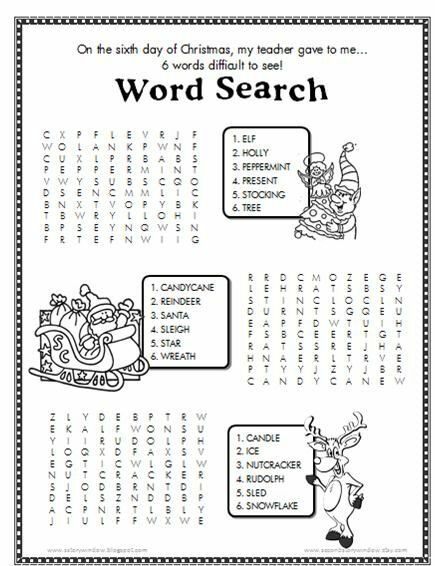 Anyway, today's fun-ness are some word searches for your little ones. You can get the file here. I limited the diagonal words to only one per puzzle (I think). Hopefully that means the kiddos can finish without taking too much of the day. 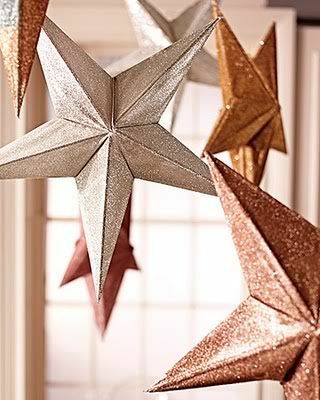 ...My teacher gave to me a 5-pointed star that's bendy." Gah! Who writes this stuff?? This isn't quite that elaborate. For ours, each kid needs a copy of the paper, scissors, and crayons or whatever else you want them to decorate with. 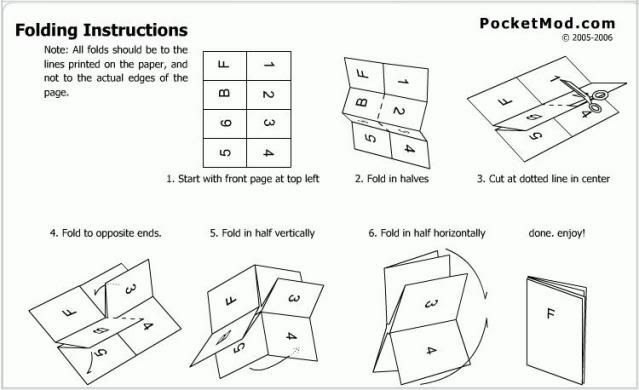 Whenever you're doing paper folding with young children, I think it's easiest to have an example already done and another one you can model the steps with. In my class it would sound something like this. "Everybody cut out the star on the black, dotted line. Hold it up when you're done." I don't move on until I can see everyone has completed that step. I try to station myself next to the one or two kids that struggle when it comes to cutting/folding activities. There's always at least 1! Once all the stars are cut, I point out the line that runs from the top point down to the bottom middle. "Everybody fold on that line. If you've got it, check to see if a neighbor needs help. When you're finished hold it up." After all of the stars are folded on the line, I have them fold it on the same line, but fold the star closed this time so you can't see the markings. Eventually we'll be creating mountain and valley folds, but it's just easier for them if all the lines are folded both ways first. When all the lines are folded (and a few are probably mangled now), I point out how some of the lines are dotted and some are solid. The dotted lines need to be pushed out like mountains. The solid lines need to be pushed down like valleys. It might take them a second or two to get the hang of it. And there you go! A pointy star ready to be decorated! And time for teacher to take some Tylenol. Get the star paper here. Teacher thinks she's a comedian! Today we're making a riddle-filled flap book. 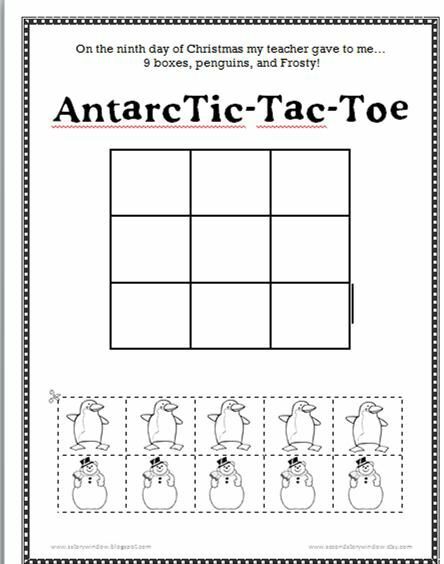 For this activity, each student needs a copy of the main page. Students should cut around the outside dotted line. That will leave them with a large rectangle. Fold the paper in half on the thick black line. Then cut each of the short dotted lines. Everyone also needs a copy of the answers. There are 2 sets to a page. You know, fewer copies to make, right? 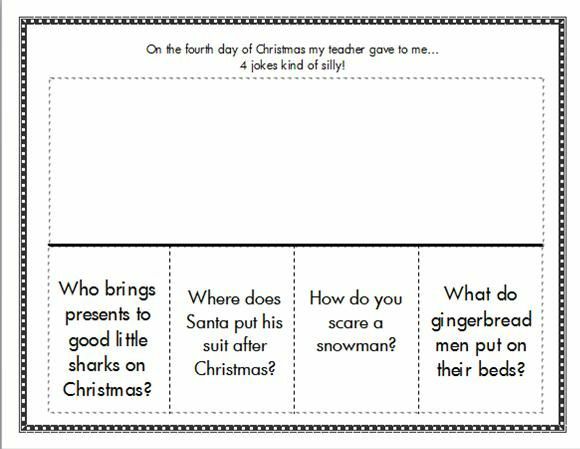 Have the kiddos cut out the answers and try to match them to the correct riddle. I tried to find riddles that 1-2 graders would have enough schema to understand. Mine seem to do okay with these, so I think they'll tickle most kids' funny bones. The pictures are glued underneath the flap, so make sure to stress not to cut the flaps while the paper is still folded. Of course, no matter how many times you remind them not to you'll still have one that does it anyway. Best to keep an extra copy on hand. The pages can be found here. We have 3 round circles. Well, that doesn't sound too exciting. Unless, of course, you get to use the circles to make your very own SNOWMAN BOOKMARK! It certainly doesn't get more exciting than that. 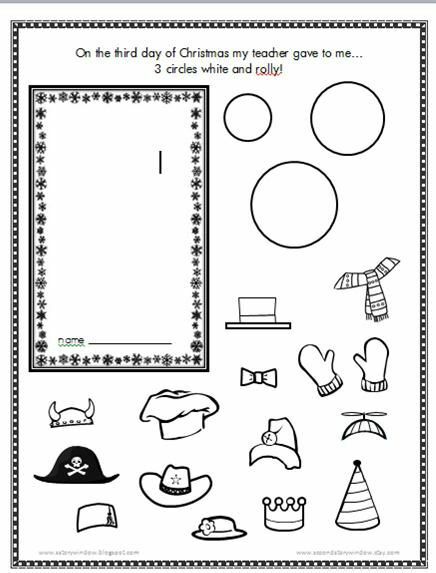 Students can cut out and arrange the circles and then use the props to decorate their new snow friend or draw their own accessories. Almost forgot-- the link is here.